When refurbishing machines, converting from DC to AC motors and drives has many advantages. They include the use of AC variable speed drives to improve reliability, reduce running costs and provide energy savings. Over 20 years ago DC motors and drives dominated many markets and industries. The reason was that only DC motors could achieve the high starting torque followed by constant torque at low speeds. Times have changed, and modern AC variable speed drives (VSDs) and motors are standard in most new machines. The same benefits works with existing machines by converting from DC to AC motors and drives. Markedly, they improve the power factor to near unity, reducing losses in the supply cables and transformers. Converting from DC to AC motors and drives can avoid the cost of power-factor-correction equipment. Furthermore, high-performance AC drives from ABB use innovative direct torque control (DTC) technology. It controls motor flux and torque directly, instead of trying to control motor currents indirectly like AC vector drives and DC drives. This means better accuracy in matching the driven system’s load requirements. One application involved converting spinning frames from inefficient DC control to AC. 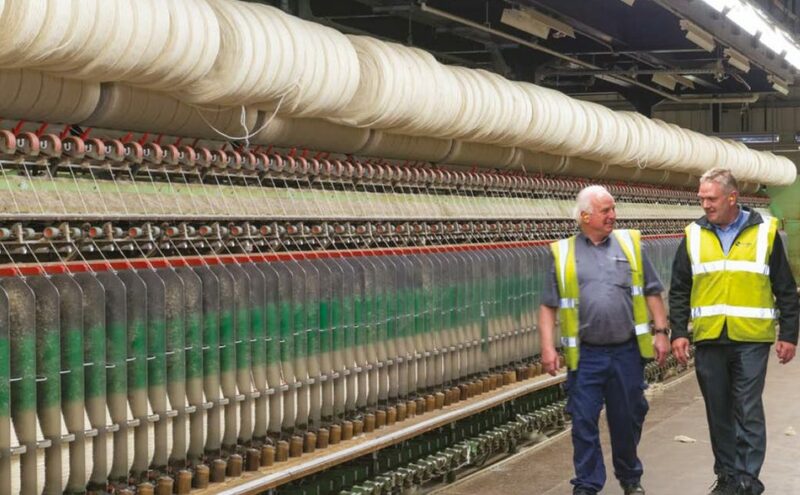 It increased production capacity of spun yarn at a leading UK carpet maker, whilst eliminating motor spare parts, lowering maintenance costs and saving energy. This was because the spinning frames used DC control, giving poor factor of about 0.4, which meant heavy current usage. However, the AC VSD solution vastly improved the power factor, reducing current and subsequently active power. Furthermore, the existing DC motors were obsolete, and spares were not readily available. The 75 kW motors needed regular maintenance with each requiring 12 carbon brush changes every year. The cost in materials alone was over was over£5000. On the other hand, AC induction motors are easily repaired or rewound, simplifying maintenance and reducing the need for spares. Performance rather than energy saving was the motivation for the conversion. However, early trials using ABB industrial drives with DTC revealed 19 percent energy savings, equating to 0.5 MW per year. Finally, together with the installation of IE3 ABB motors, a ROI of three years was forecast. With the Government’s Enhanced Capital Allowance, payback time fell to 2.6 years on energy saving alone.